Loibel Lottermann is one of the proud founders of a great local business, Loibels Fitness Dance Center. For more than 10 years, she has been helping adults and children in South Florida to get fit while having fun. Her passion is to help her students to feel great about themselves through her unique blend of inspiration, while actually helping them achieve a healthier lifestyle. Nothing is more rewarding than watching their bodies transform and their joy for life grow. What is so great for all of them is that we do it all together, as one team, filled with laughter, new friendships and unending support for one another. Loibel grew up in Venezuela and earned her college degree in Computer Science, but her true passion was for international dance. At the age of 4, Loibel began training in ballet and continued to Venezuelan folk dance - performing and competing all over Venezuela. She is also professionally trained in ballroom, hip hop, jazz and flamenco dance. Loibel is one of the best known and respected Zumba® instructors in South Florida. She has been teaching Zumba® from its early inception – and one of the driving forces of Zumba’s® success in this area. 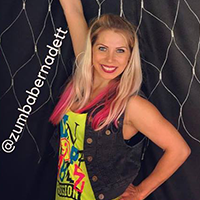 She is one of the original Zumba® Boca Chicas – appearing numerous times with Beto Perez in his workshops and videos – including the Zumba® Instructor Training videos 12, 18, and 21. Loibel has been showcased at National Fitness Conferences – including the 2008 IDEA Las Vegas and the 2008 ECA Miami. Her television credits include the Sabado Givante Show (Univision), Escandalo Show (Telefutura) and Making Menudo (MTV). She is also in the Kellogg’s videos as a Zumba® dancer. Loibel is licensed to teach Zumba®, Zumba Sentao®, Zumba® Gold, Zumba® Kids Jr. and Zumba® Kids. She is also AFAA Certified and is a Pound® Pro. Originally from Hungary, Bernadett’s mission is making a positive difference in peoples lives through her passion. She is a group & dance fitness instructor, who brings over 20 years of experience in dance and fitness industry. While completing her Finance Degree, her enthusiasm for dance and fitness led her to become a group fitness instructor & continue inspire people everyday. In addition she has trained in ballroom dance, jazz, and hip-hop. As one of the most well known Zumba® Instructors, Bernadett has been teaching Zumba® from its early inception. She has been one of the driving forces for Zumba’s® success in South Florida; with a huge following in Boca Raton. She is also one of the original Zumba® Boca Chicas; appearing with Beto Perez, the creator of Zumba®, in workshops, videos, and the Zumba® Instructors Training videos ( ZIN 12,18, 21). Bernadett is licensed to teach Zumba®, Zumba® Sentao, Zumba® Gold, Zumba® Toning, Aqua Zumba®, Zumba® Kids Jr. and Zumba® Kids. She is also AFAA Certified. At the young age of 4, Hugo began to witness all kinds of art form, including music, dance, singing, and painting, coming from his parents. In his home country of Chile, it is his parents who instilled in him the love and passion for the arts. He is really proud and thankful of his family’s love and support, as well as all of his dear friends, teachers, instructors, and mentors who believed in his talent and helped him to become the dancer he is today. Hugo‘s love for dance led him to become a Zumba® Instructor in 2009. 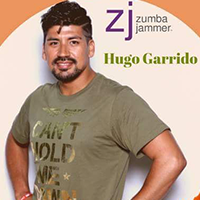 Then from July 2011-December 2012, Hugo was Minnesota’s Zumba® Jammer. He participated as ZJ in IRSHA Los Angeles CA February 2012 in the Augies Quest Zumbathon® with others ZJs and ZES with Beto Perez. At the Zumba® Convention 2012 and 2013 in Orlando, FL, Hugo was a back up Dancer from the Zumba® Fuze with Loibel Lottermann and Bernadett Fejszes (The Boca Chicas) and well as back up dancer for Flamenco Fever with the Amazing Fabio Barros in the Zumba® Convention 2013 in Orlando, FL. He is now a Zumba® Jammer for Florida from 2014 as well as a well-known and sought after instructor. Hugo is licensed to teach Zumba®, Zumba® Gold, Zumba® Toning, Zumba® Gold Toning, Zumba® Sentao, Zumba® Kids Jr. and Zumba® Kids. He is also AFAA Certified. Catherine is originally from London, England. Her love and passion for dance and performing was evident from a very early age. At the age of 15, she auditioned for admittance to the prestigious ‘Performers Dance College’ in London and successfully completed a rigorous three year professional course in dance and musical theatre. Afterwards, she gained her graduate ballet associate with ‘Honors’ and full equity performers license. Catherine danced and performed throughout London and surrounding areas, from West End musical tours, Annie, Beauty and the Beast, to Pantomimes, summer seasons, and backing dancers in trade shows and videos. Catherine has also danced in Queensland Australia and Eilat in Egypt. Wanting to travel more, Catherine started a career in the cruise industry and performed on Costa, Princess and Carnival super liners, traveling around the Caribbean and Europe while performing in a vast variety of shows from Broadway, Jazz, Latin to pop! Catherine also performed in multiple illusion magic shows as lead illusion dancer while also choreographing and staging these shows. Catherine quickly progressed from Company Manager to Dance Captain and was ultimately promoted to a shore-side role as Dancer Supervisor where she was responsible for the staging, teaching and assisting choreography for nine production shows across four cruise ships with a total cast of 48 dancers and six production singers. Catherine left the cruise industry and settled in South Florida after getting married and having her first child. However, she continues to pursue her passion for teaching and fitness as an instructor for Zumba, dance and Barre. Patti teaches Body Sculpting and Pound® classes at Loibels Fitness Dance Center. She has been an instructor for 25 years and is an AAFA certified instructor. She became Zumba® certified in April of 2013. Patti is very focused on safety, using movements that are both effective and safe. 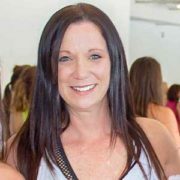 Patti is licensed to teach Zumba®, Zumba® Gold, Zumba® Toning, Zumba® Kids Jr. and Zumba® Kids. She is also a Pound® Pro. Instructors Loibels Fitness Dance Center, we are pleased to have some of the finest, most sought after, talented instructors in South Florida. With years of experience in Zumba and Group Fitness, our instructors are also certified in some of the newest fitness crazes, including Pound, POP Stretch and Tone as well as Combat FIT. We also have talented instructors in Latin Moves and Hip Hop. – Loibel is the Founder of Loibels Fitness Dance Center and Zumba ® Instructor. Loibel is licensed to teach Zumba®, Zumba Sentao®, Zumba® Gold, Zumba® Kids Jr. and Zumba® Kids, & zumbini®. She is also AFAA Certified and is a Pound® Pro. – Bernadett teaches Zumba® at Loibels Fitness Dance Center. Bernadett is licensed to teach Zumba®, Zumba® Sentao, Zumba® Gold, Zumba® Toning, Aqua Zumba®, Zumba® Kids Jr. and Zumba® Kids. She is also AFAA Certified. 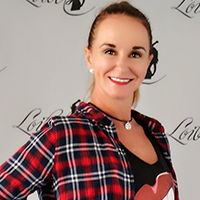 – Catherine teaches at Loibels Fitness Dance Center. Catherine is licensed to teach Zumba®. – Hugo teaches Zumba® and Zumba® Gold at Loibels Fitness Dance Center. Hugo is licensed to teach Zumba®, Zumba® Gold, Zumba® Toning, Zumba® Gold Toning, Zumba® Sentao, Zumba® Kids Jr. and Zumba® Kids. He is also AFAA Certified. – Patti teaches Pound Fitness and Body Sculpt at Loibels Fitness Dance Center. Patti is licensed to teach Zumba®, Zumba® Gold, Zumba® Toning, Zumba® Kids Jr. and Zumba® Kids. She is also a Pound® Pro. – Dawn teaches Total Body Conditioning. She is certified for over 20 years. Dawn is also our AdvoCare pro, who will help you find the best nutritional and wellness program for you.